Modal Mania: Janette requires some advice: You ought to. In my book, gift giving is a pleasure but thinking of an appropriate gift, locating it and then ensuring you are permitted to use plastic to pay for it can sometimes be a pain in the neck. My mother is only interested in 3 things in life: Bach, hats, and church bells. Stereotypically speaking, women like to have a big wardrobe for all their clothes but my mother needs to have a whole room to store all her hats. In her free time she runs from one village church to another yanking bell ropes and our family home shakes as Bach’s B minor mass blares out most evenings irritating the deer and foxes. With this in mind, I need your help. 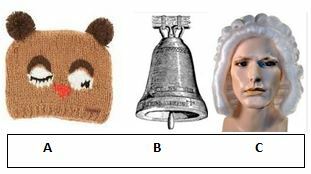 What ought I to buy her, the woolly bear hat, the church bell or the wig? Let me know, when you have a moment. Posted on Aug 21, 2017 Jul 22, 2017 by Inglés MálagaPosted in Grammar, SpeakingTagged advice, aprende ingles malaga, gifts, modal verbs, shopping. Previous Previous post: Modal Mania: Janette requires some advice: You should..
Next Next post: Modal Mania: Janette it is prohibited: You are not allowed to..